Back in February we introduced you to the sound of The Moons. 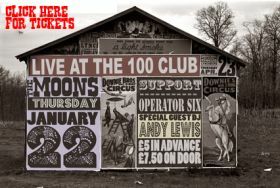 Well now we’re pleased to see that next month they play a rare live show at London’s legendary 100 Club. The gig will take place on Thursday January 22nd, with support from Operator Six. Andy Lewis (who along with Moons mainman Andy Crofts is currently a member of Paul Weller’s band) will be behind the decks all night, so expect some excellent mod-shaped tunes all night. Tickets are £5 in advance from here, or £7.50 on the door. The night kicks off at 7.30pm. The Northampton four-piece has recently been hard at work on their debut album, which is expected early in 2009. For more on The Moons have a listen to their Myspace page here, or become a fan on Facebook here.